For women of all ages and stages of fitness. You can choose to go for a short or long walk all in the company of other women. At the end of the walk each evening a healthy low-fat supper will be provided and someone will give a short talk on women’s health, diet, and other issues of interest to women. 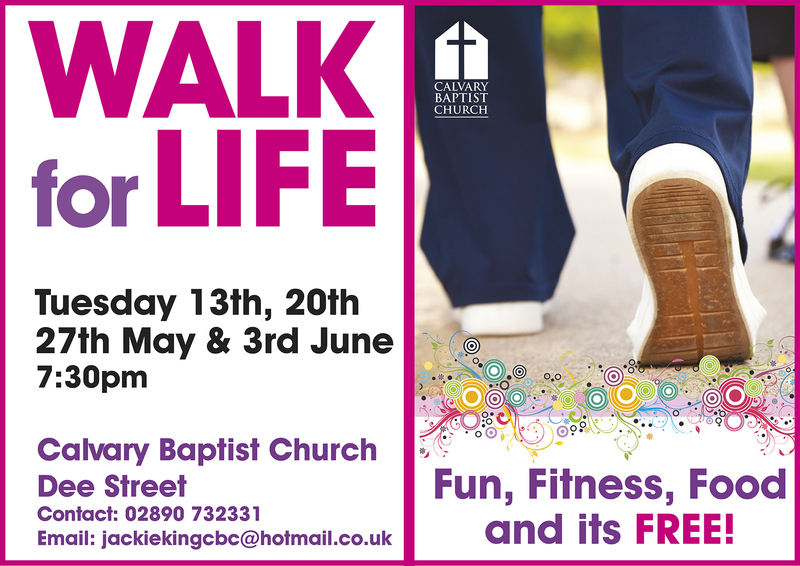 Come along and meet new friends while getting in shape for the summer! ‘You know that church on the corner of Dee Street’ Thats us! You have probably drove or walked past us hundreds of times and we want you to know that you are welcome in our Church. No matter who you are, what you have done and where you are right now, God’s door at Calvary is always open to you. We are ordinary, down-to-earth people who understand the real struggles in life and we want to share the love of God with you. We want you to know what Jesus Christ has personally done for you and how he can help and transform your circumstances. We would love you to come and visit us at our Sunday Morning service at 11:30am or our Sunday Night service at 7pm. Keep checking back over the coming weeks, as we will be adding lots of new content.